Each of us who are a little bit carried away by cryptocurrencies and plunged into this wonderful world, dreams that cryptocurrencies were not useless tokens, but brought benefit and had a certain value. What value are we talking about? I'll explain. Now more and more projects began to appear whose tokens are supported by real things or values. So recently I wrote about the project whose coins are supported by precious metals such as gold, platinum and silver. The review of today's project is something very similar, since its based concept is also aimed at linking its token with emeralds. Interesting, isn't it? First you need to understand what are the difficulties and problems in the industry. Despite the fact that the production of emeralds is one of the broad and multi-million fields of industry and the demand for this type of stone is increasing day by day, investments in emeralds are relatively complex. How is it complicated? First, it's expensive. Secondly, to invest in emeralds in the classical way, you must have the knowledge and all the necessary skills to be sure that you are getting. 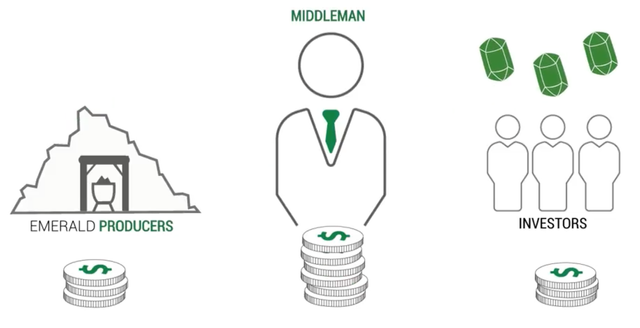 Third, there are a large number of intermediaries because of which you are forced to overpay. For this reason, both producers and buyers lose profit, overpaying for additional services to third parties. At the junction of such problems, the idea was born to replace the traditional system of relations between the producer and the consumer with a more modern, transparent and safe one. And of course we are talking about the introduction of modern Blockchain technology in the environment of emerald production. The project that decided to take on this responsibility is called – GEMERA. This project intends to use its internal token and reinforce it with Colombian emeralds. Thus, to guarantee support to producers, allowing them to receive more profit for emeralds, and to the buyer to get jewels at lower price. 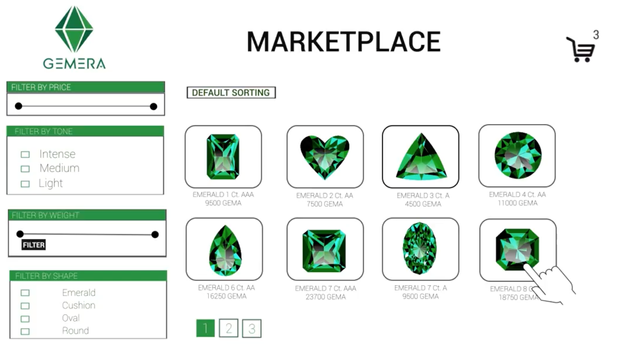 The platform itself will be developed on the principle of the MarketPlace, where all the necessary information about their quality and other useful aspects necessary for assessing the quality of emeralds will be concentrated. Also, various kinds of certificates of quality, photos and videos of emeralds will be available. In this case, the investor does not have to be too much expert in the production of emeralds. 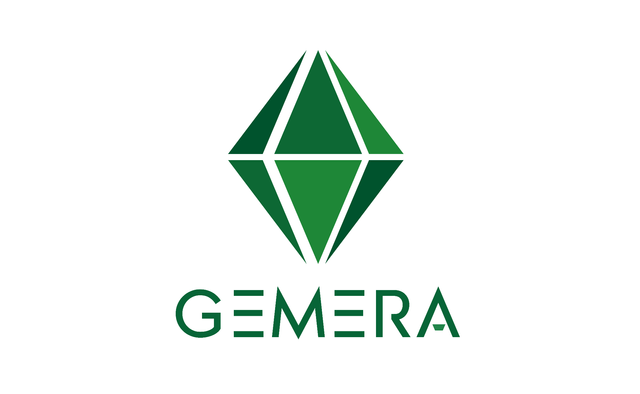 All information will be simple and clear, and most importantly safe, as Gemera intends to act as a reliable partner for both manufacturers and consumers. This modern approach will expand the traditional industry and bring this sector of the market to a new level. Many of you have probably wondered why this project decided to rely on the production of Colombian emeralds? So here's a little touch on this topic, I found that Colombian emeralds are famous for their quality, color and extremely physical properties. All this differs from many other international manufacturers for more than 4.5 centuries. Many experts believe that the recipe for the success of emeralds are a number of adjacent rocks of minerals that began to form at the time of the formation of the Andes mountains themselves. The cost of such emeralds varies from $ 5,000 to $ 15,000 per carat. But still there are many facts and nuances that affect the final cost of a particular instance, sometimes they can reach a record price of up to 80,000 dollars per carat. Thus, Gemera intends to offer favorable conditions to us as investors, allowing us to have not only digital assets, but also to protect them with valuable and high-quality Colombian emeralds. At the same time, Gemera developers have made every effort to develop a truly unique platform that meets all the necessary requirements for transparency, information content and security. As mentioned earlier, all management and ownership of precious stones is carried out with the help of an internal token – GEMA. These tokens carry the same value as Colombian emeralds, as each of the tokens is supported by Colombian emerald. The security of transactions is controlled by smart contracts, while allowing you to leave a high level of transparency and security of all payments. Gemera is slightly different from other similar projects in that it will not conduct ICO. Tokens will be available for purchase only in cases when a new batch of emeralds is mined and after they get to a safe storage. This store is located in Hong Kong and very soon will be available for purchase the first batch of emeralds. The first investors will have the opportunity to purchase their assets with a 10% discount, which is also a nice bonus. You can purchase THE GEMA token using ETH. I liked this project very much, because I believe that projects of this kind allow me to take a different look at the world of cryptocurrencies. Now they will not just be digital assets, but also have physical value backed by Colombian emeralds of the highest quality. That is, you buy and invest not in the air, but in material values, which is very nice, while everything will be at the highest level, relying on the transparency and security of the Blockchain. But still, in order to understand in more detail the peculiarities of the transaction, how the transfer of emeralds will take place, after the sale of tokens and other issues of interest to you, I suggest that you familiarize yourself with the details of the project on its official resources. All necessary links are attached below. I think so! The project has great potential! A very worthy candidate for investment: a great and necessary idea, professional team, well-known advisors, just excellent ratings on all independent sites. Yes, indeed it is! Thanks for the feedback! I'm sure they'll get it!